Just as expected the viewing figures for the final of this year’s Eurovision Song Contest did suffer a significant drop in Denmark. An Olympic qualification match and a religious holiday took quite some TV viewers away from the music competition hosted from Baku. In Denmark the viewing figures for the Eurovision Song Contest is among some of the highest over the entire year with usually between 1,5 and 2 million people watching the show if Denmark is participating in the final – out of a population of 5,5 million. This year however there is no reason for Danish broadcaster, DR, to celebrate – not the result Soluna Samay achieved in Baku nor the viewing figures. 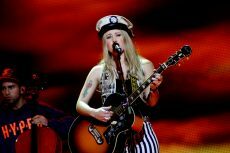 Last year Denmark also suffered a drop in the viewing figures for the final, but it wasn’t more than around 100.000 viewers where it this year dropped with more than half a million. Saturday evening 847.000 watched the Eurovision Song Contest final on DR1 with another 143.000 tuned into DR HD instead. Added up this gives a total number of viewers at 990.000. In 2011 1.587.000 saw A Friend In London ending 5th at the contest held in Düsseldorf. The viewing figures should not be seen as the Danes lost faith in their own chances at the Eurovision Song Contest, more that it was in tough competition with TV2 broadcasting an Olympic handball qualification match and it being Pentecost, which many used to go away for holiday enjoying the good weather, which it also was in Denmark.